Ezra Schwartz was eighteen. I am eighteen. Ezra Schwartz went to a religious Jewish high school and spent his summers in a Jewish sleep-away camp. I went to a religious Jewish high school, and also spent my summers in a Jewish sleep-away camp – similar to the one Ezra did, Camp Yavneh. Ezra Schwartz made the noble and brave decision to go to Israel for his gap year, to a religious, orthodox institution for overseas students called Ashreinu. I too made that choice, and ended up in Yeshivat Shaalvim’s American program – a religious, orthodox institution for overseas students. Last Thursday, Ezra was killed. I am alive. I didn’t know Ezra. I won’t ever know Ezra. But since that twisted nightmare of a day last week, I have heard and learned so much about him. I felt my heart stop when my friend told me an American in Ashreinu was one of the victims of a shooting attack in Gush Etzion, a known area of the Judea and Samaria region of Israel. My stomach churned when I heard he was the roommate of a close friend, one who happened to have been sitting next to Ezra in the van during that hellish moment. I tasted vomit when I read that he had in fact been killed, and was not in critical condition, as so many news agencies that we rely on here for information initially reported on Twitter. And when his picture was published, I felt the tears begin to flow. In his smile, I see so many of my friends. The clothes he wears in his Facebook pictures – I recognize them from my closet. The look on his face in the pictures of him with his friends – it’s eerily similar to the one on my face, on my banner picture on my Facebook profile, with my friends. I know him through dozens of mutual friends. I see myself in Ezra, and I see my friends. I see the hundreds of kids that flock to Israel from America to take their gap year (or two) here. So when I heard about Ezra, when it had fully sunk in that a normal teenager, from America, here for his gap year, was actually killed – actually murdered – in a terrorist attack, I immediately imagined my friends being killed. Myself being killed. This kid that I didn’t know, Ezra, being killed. I will not turn Tzomet HaGush and Ezra’s death into a political battlefield, like many people have decided to do. I won’t cry, “It’s the settlers!” or, “No, we need more settlements!”. I won’t demand revenge or demand mercy – no, not yet. It isn’t the time, and this isn’t the platform. Right now, we still have to mourn. So what I will do is talk about what it feels like to be here right now, as an American Yeshiva student, as an American in Israel for my gap year. On Thursday, so many of us were already saddened by the killing of two Israelis in Tel Aviv, two middle-aged men killed while praying, two fathers, two husbands. But, as has become an unfortunate normalcy in this trying time, we read the report, we’re silent for a few moments, turn to one another to say how terrible it was and how we just couldn’t believe it. Then we put our phones away, go back into our beit medrash, our study hall, and continue on with our day. That evening, information came in pieces. News agencies kept reporting differently. There was shooting attack near the Gush junction (the same place where, two summers ago, three teenagers were kidnapped and murdered. One of them, Naftali, was from the community where I am now studying). There were ten injured, and at least two Israelis dead. No, wait; one of them was an American 18 year old. As usual with tragedy, the original confusion is almost thick enough for you to reach out and touch. So many people were saying so many different things. Soon another student and I learned that the eighteen-year-old American was a “shana aleph”, a “year one” student from Ashreinu. Then we heard he was a roommate of a friend of ours, whom some people were saying was headed to the hospital in critical condition himself. I left the Yeshiva building. I couldn’t breathe. I couldn’t see. I couldn’t think. I couldn’t feel. You see, as Americans, we come from a very secure, safe environment. Be it Sharon, Massachusetts or Teaneck, New Jersey, we can walk around not having to worry about being stabbed in the back. Not only do we feel that very security as Jews, but also as human beings. If you’ve ever been in traffic, then you know how frustrating being stuck for so long and traveling such a small distance can be. But try to imagine constantly looking over your shoulder to see if someone is coming to ram into your car and shoot you in the back of your head. With this sense of security that we have, as Americans, often times when we hear or read about a terrorist attack in Israel, we’ll chalk it up to the norm – because it has indeed become the norm. An American isn’t supposed to be killed in a terrorist attack… Israelis are. Right? So I couldn’t believe it. I was in shock. I walked around thinking how how how how why why why why. I simply couldn’t understand. At around seven thirty at night we knew what had happened. 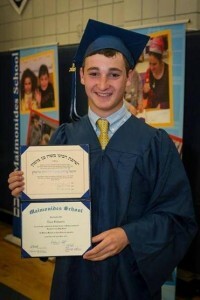 Ezra Schwartz, 18, from Sharon, Massachusetts, who went to Camp Yavneh and who liked to play baseball and help people and laugh and who went to Ashreinu and who was roommates with my friend and who wears the same clothes as me and who had a future and dreams and aspirations and heroes and questions about life and God and religion and was probably so excited for Rutgers next year and who probably caught colds and had headaches and fevers and who cried and had favorite foods and probably had a favorite one that his mom would make every Shabbat and got into arguments with siblings friends and parents and lived such an eerily similar life to mine, was dead. In my broken, distraught state, I did what any good Jewish boy should, would and could do: I called my mom. I called my mom and cried. I curled up on the dark steps of our chadar ochel, our dining room, and wept for forty minutes. I thought of how it could have been me delivering food to soldiers, it could have been me going to see a friend in the Gush. It could have been anyone. I wept and wept. I even begged God for a break, and asked if someone else could be the chosen people for just a few weeks, until we heal and get back on our feet. I find myself here in Yeshiva asking myself questions I should never have to ponder. When I lay out my clothes at night, it really shouldn’t cross my mind whether or not these clothes will be what I’m wearing when I die. When I’m debating going out to see some friends, literally asking myself if it’s worth risking my life to drive to the city should stay far away from the equation. And I really, really should not have to write a letter to my family with “Just in Case” written on the envelope. So how do we move on? How do we continue? The weekly Torah portion of this past week, the week Ezra Schwartz, Yakov Don, Avira Reuben, and Aron Yesiab zichronam l’bracha, may they be remembered for a blessing, were killed, is the portion where God appears to Jacob in Beit El, and tells him the land that he is sleeping on will belong to his children. The offspring of Jacob will return to the land. I had the privilege of being in Beit El (a settlement not too far from the Gush) this past Shabbat, and was during that very emotional, very inspirational weekend that I realized that we’ve returned – but there’s a caveat: the land comes at a price. And that price is Ezra. That price is every single terror victim in the land of Israel. And we are here because we pay it. And if we are here, we will live. And we must live in order to move on. Life goes on. It is dark now, but it will become lighter. We will pray, and study, for we will not hide our faces from God just because He hides His from us. We will live; we will go out at night and have dinner or go see a movie or go meet with friends. We will go on walks if we so please. We will thrive here, and we will tell our children and our grandchildren that we stayed in Israel, we lived here, during a year so bad and so wild that people were killed to the point of normalcy, that people were stabbed almost daily, that people were killed praying, eating, driving, walking, shopping, talking – living; a year when people, people like Ezra Schwartz, were killed bringing food to soldiers who were protecting him. We will live like how Ezra and everyone else would have: with laughter, love, and kindness. On Friday I etched Ezra’s name into my siddur, my prayer book, and onto my shtender, my bookstand. I will live every day I have left of my time here like I believe Ezra would have. And that is how I will continue to know Ezra – through myself, and through those around me – doing the same thing. May God comfort the Schwartzs, all the families of victims of terror – and all of us – among the mourners of Zion, speedily in our days. The author is a student at Yeshivat Shaalvim and a graduate of Davis Renov Stahler Highschool.